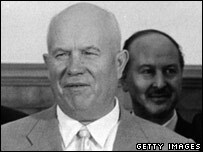 Fifty years ago the leader of the Soviet Union, Nikita Khrushchev, stunned the communist world by denouncing his predecessor, Stalin, as a torturer and a murderer. But the speech was made in secret to the Communist Party elite, so how did it leak out? Former Reuters and BBC correspondent John Rettie reflects on how he broke the story. One evening, early in March 1956, I was in my Moscow flat packing before leaving on holiday to Stockholm the following morning when the phone rang. It was Kostya Orlov, a young Soviet citizen of my acquaintance, whose urgent voice I heard saying: "I've got to see you before you go." I was reluctant, as it was getting late and I had to leave early for a break I was more than ready for. For 10 days in February, Moscow's few Western correspondents had been covering the 20th Congress of the Soviet Communist Party, where "the cult of personality", a veiled reference to Stalin, was repeatedly denounced. But the night after the congress formally closed, the party's Central Committee building was humming with activity into the early hours, its windows ablaze with light. Why, we wondered, after the congress was over? And then the rumours began. Khrushchev, it was said, had made a shattering report to a secret session, openly denouncing Stalin by name as a murderer and torturer of party members. This was so traumatic that it is now said some delegates had heart attacks during the speech, and others committed suicide afterwards. Hearing the urgency in Orlov's voice, I invited him over at once. In those days a Westerner was lucky to have any unofficial Soviet friends. 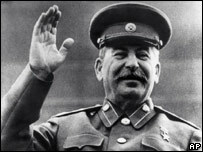 Under Stalin, no Soviet citizen would have dared risk unauthorised contact with a foreigner. It would have meant instant arrest as a suspected spy. True, in the three years since his death, Moscow's citizens had relaxed somewhat under the warm glow of Khrushchev's "thaw", but not all that much. Fear still lurked only just beneath the surface, and Muscovites were still very wary. But Orlov seemed quite unperturbed. I had met him a year before and he had invited me to his single room in a communal dwelling, where so many Soviet citizens still lived in wretched conditions, a decade after World War II. More often, though, he came to my flat in a block reserved for Westerners, whose entrance was guarded round the clock to keep Soviet citizens out. But Orlov came and went without trouble, which made me suspect him of working for the KGB. Naive, of course, I should have guessed that he definitely was, though he always hotly denied it, even 30 years later. But still, he had often given me useful scraps of information, though nothing of great importance. Without any notes, he launched into a detailed account of the very speech we had been hearing about, which was even more sensational than I had thought. He said it was being read to party meetings, and that a friend of his was a local party secretary who had let him see it. But the question was: could I believe him? Yes, it fitted in with what little we did know, and Orlov had been right about lesser matters before. Still, I did not feel I could on my own break the censorship and file such an earth-shaking and dubiously sourced story from outside the country. What if it were a false plant? The consequences could be dire, both for me and for Reuters. I called Sidney Weiland, who was my boss, and arranged to meet him at midnight. To avoid microphones, we tramped through the snow as I told him the whole tale, pausing just now and then under street lights to consult my notes. And in the end we decided we did believe it. The next day I flew nervously to Stockholm with my notebook burning a hole in my pocket. I asked Reuters to keep my name off the story and use a dateline other than Moscow. After all, I had to go back there and was desperate not to be suspected of breaking the censorship. In the event nothing happened to me when I returned, until the autumn, that is, when shockwaves from the speech unleashed the Hungarian uprising, unrest all over Central Europe and even within the Soviet Union itself. In Moscow the thaw turned to deep freeze, and soon afterwards the KGB began to put pressure on me. So I asked to be recalled to London, and never expected to go back to Moscow. But 32 years later, in the new thaw of Mikhail Gorbachev, I did go back, this time for the Guardian newspaper. By then it was obvious to me that Orlov could not possibly have been acting on his own. So who had ordered that he should pass details of the speech to me? Could it have been Nikita Khrushchev himself, who wanted the world to know that he had broken with Stalin? Everybody I asked agreed that it probably was and I think so too, but will never find out for sure. From Our Own Correspondent was broadcast on Saturday, 18 February, 2006 at 1130 GMT on BBC Radio 4. Please check the programme schedules for World Service transmission times.